ETH-LAD, otherwise known as 6-ethyl-6-nor-lysergic acid diethylamide is a synthetic psychedelic from the lysergamide family with similar effects to the designer drug LSD. It was first mentioned by the famous chemist Alexander Shulgin in his book THiKAL. ETH-LAD is thought to be a partial 5-HT2A agonist, which is assumed to be the behavior that causes the effects of psychedelia. 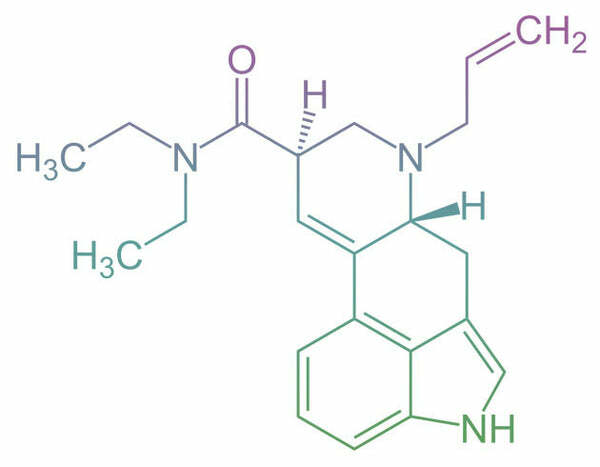 This compound has been described as more stoning and sedating than it's relatives LSD and LSZ which implies less action happening in the norepinephrine and dopamine systems of the brain. It is also referred to as a semi-synthetic alkaloid that is a structural analog of LSD. Its toxicity profile is unknown due to the lack of scientific studies done on it. Most people feel that because it is relative of LSD (acid) it is generally a safe substance due to LSD's safety profile. However, it cannot be known for certain until ETH-LAD is further studied. If you choose to buy ETH-LAD online through a research chemical vendor (such as Causing Color) then you need to be aware of the legal status in your origin country. This will allow you to avoid any future legal troubles with the law. This research chemical is not for human consumption and should be used by a licensed research facility for evaluation. While handling this compound it is recommended to wear gloves due to it being active in the mcg range. For storing be sure to keep it out of sunlight and preferably in a cool, dry, and enclosed area. My order has not been fulfilled. It has shown on tracking that it is in New York, as of the 24th of January. I sent an email asking about this and received an email saying I'd get a response within 4 days. I still have not heard anything regarding whether my order will be re shipped or if I am just going to bite it on this one. I really hoped for better with this. I'm still open to this being corrected, but if not, I'll shop elsewhere in the future. So, this far I'm pretty disappointed. Your order has been fulfilled, hence why it's currently in New York. We do not control the mailing service nor do we control the customs department. Most orders take a long while to go through New York, and you will most likely get your package. As for email, we have changed our customer support policy and will generally take 3-7 days to answer due to many people asking ill relevant questions when most of the answers can be found on our FAQS page or terms of service. On that note, we do not do reships if customs keeps your package, however, if your package was lost in the mailing system or you have some other problem then we will most likely reship. With that being said, you're mainly giving a 1 star review on factors we do not control at all. Which is not very logical if you were ask me! (ha) You should be calling up New York customs and telling them to hurry up or else you'll give them a 1 star review. Though, that probably wouldn't work in your favor. Excellent product for research just as I thought it would be!! !